Finally we got a summer! So I took Momsies to The Flying Pig for their Happy…er…’Appy Hour. It was a good deal. Food were $6 and drinks (house red or white wine, or house beer) were $4.75. We went to the Olympic Village location as it was walking distance. We had originally wanted the steamed mussels that was on their menu online, but turns out that menu was outdated. 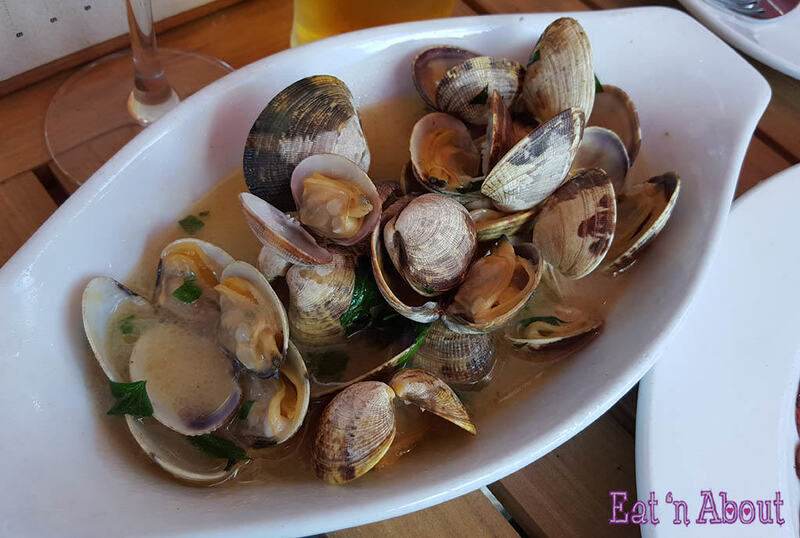 In store was Steamed Clams ($6) in a white wine & herb sauce. It was very buttery. The clams were very clean (not sandy) and very sweet. The broth was also really really good, not overly salty. I was able to get some bread from our server for dipping. 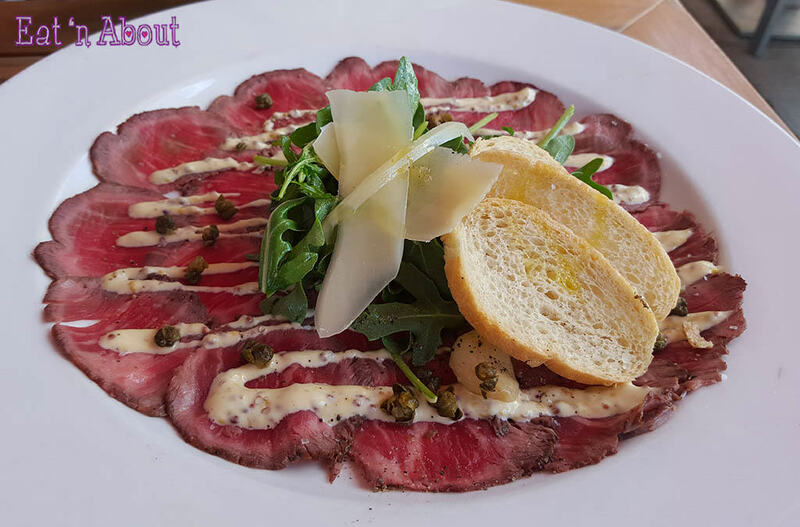 I also wanted the Beef Carpaccio ($6) which came drizzled with dijon aioli, and served with 3 slices of xvoo crostinis. The beef was very tender and not at all chewy. The capers went very well and the aioli was delicious. Pickled garlic cloves were also a nice touch. Only wish there were more crostinis though. 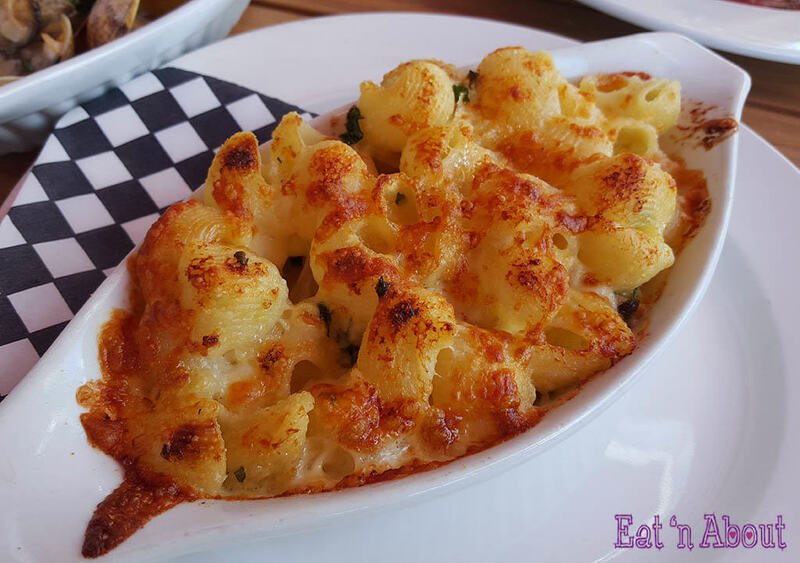 Lastly to fill me up was the Truffled Jumbo Macaroni ($6) in a 4 cheese cream sauce. Mom was initially worried about this being too cheesy as she’s not really a fan of cheese. Luckily the cheese was not overpowering (I didn’t find out which 4 cheeses was in the sauce) and Mom ended up enjoying this too. Drinks-wise Mom ordered a beer and I had a white wine. All in all it was a lovely afternoon and a great meal.